Every 9 minutes, a child or teen is sexually abused. Of all victims under 18, 66% are ages 12-17 and 34% are under the age of 12. 1 in 9 girls and 1 in 53 boys under the age of 18 experiences sexual at the hands of an adult. Among cases of child sexual abuse reported, 93% are known to them (59% of perpetrators are acquaintances, 34% are family members) and 7% are strangers. 18 percent of girls and 3 percent of boys say that by age 17 they have been victims of a sexual assault or abuse at the hands of another adolescent. 66 percent – of adolescent victims did not tell a parent or any other adult about the assault. Only 19 percent reported the assault to the police. Speak tells the story of Melinda, a high school freshman who busts up an end of summer party due to an unnamed incident. In Speak, Melinda tells her story of being ostracized by her peers because she will not say why she called the police. 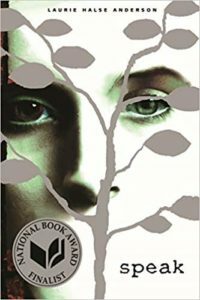 Speak is an excellent book for both teens and adults. It is good for both males and females. Speak will give everyone a deeper understanding of what it “feels” like to live through the trauma of sexual assault, dealing with the side effects of the shame and victim blaming, as well as, has the potential to change behaviors of all who read it. This book discussion is an excellent opportunity for parents to have the vital discussion of sexual assault with their children. Read the book and join us on Saturday, April 27th from 3:00-5:00 pm at the Sparks Library. RSVP to Vanessa Rios, SASS Program Coordinator at (775) 221-7633 or at the events Facebook page. Date for the Spring 2019 "What Can I Do?" Community Mixer is TBD. Interact with the neighbors you might not otherwise get to meet. All services provided by Crisis Support Services of Nevada (CSSNV) are free of charge and available to anyone in any crisis situation. CSSNV does not practice nor condone discrimination on the basis of race, color, sexual orientation, age, religion, national origin, marital status, military status, political belief, mental or physical handicap, or any other preference or personal characteristic, condition, or status. Standard messaging and data rates may apply. Text STOP to cancel. For end user privacy and terms and conditions, go to: Terms and Conditions for PreventionPays™ Text.